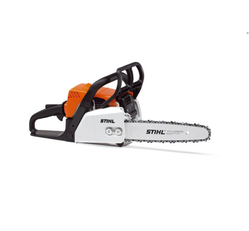 We are a leading Retailer of stihl chainsaw ms 170 and stihl cordless chain saw msa 160 from Ghaziabad, India. We offer an innovative range of Chainsaw to our clients that combine advanced technology with high power, optimum ergonomic design, and low weight. These properties minimize the burden on man and the environment. Our range is sourced from the vendor Stihl and is available in a variety of equipment versions and for all purposes. These are also supplied with power ratings from 1. 3 kw to 6. 4 kw (1. 6 hp to 8. 7 hp). Furthermore, our range is widely used in orchards, parks or gardens or on building sites. The new MSA 160 C-BQ cordless chain saw is here! This powerful 36 V class machine is impressive in terms of cutting power and comfortable operation and is the ideal tool for cutting firewood, landscape maintenance and horticulture and also for sawing in enclosed spaces. Unpack it, charge the battery, off you go: this portable, quiet, powerful machine has no power lead to get in your way and no exhaust emissions – the result of a perfect combination of the latest battery and motor technology with top-class chain saw expertise. Just what you expect from a STIHL. The new cordless chain saw offers more than just top-class cordless cutting power – thanks to innovative lithium ion technology it is mobile, clean and quiet. Practical details like the quick chain adjuster (B) which is fitted as standard and the switch lever for straightforward control provide tangible ergonomics and are very advantageous for the user. As well as user comfort, these features enable sawing to be carried out in noise-sensitive places like residential areas, parks or institutions without disturbing anyone. The new AP 160 lithium ion battery (160 Wh) is the power behind the new MSA 160 C-BQ cordless chain saw. It permits portability without fuel and quiet operation with no cable. The chain saw is low-vibration, quiet running and perfectly balanced, very maneuverable and easy to control. The low handlebar vibrations also help to reduce user fatigue. The quick chain adjuster (B), fitted as standard, enables you to tighten up the saw chain very easily and conveniently, without using tools and avoiding contact with the sharp teeth.